Liberty Con 31 is come and gone. Much of it passed in a blur for me. It was full of good times, great people, and a whole lot of running around to get to where I had to be next. Panels and signings were a whole lot of fun. My first panel of the weekend was on YA Science Fiction, moderated by Jason Cordova who did a fantastic job. David Weber was on the panel and he had some absolutely fantastic things to say about the genre, about putting hope and wonder in the hearts and minds of young adults about the future. He managed to articulate in a few words what I try to explain in a rambling, incoherent mess, half the time. The other panelists had some great things to say as well and it was a terrific way to open the weekend. I had my first signing session in the dealers room on Friday. I got the pleasure of being there with John Ringo, Chris Kennedy, and Larry Correia. As I told Larry, it was like the 300 Spartans at Thermopolyae: Their fans would blot out the sun and I would sign books in the shade. It was a fun time and I actually had a couple people come by to see me, so I’ll call it a win. Saturday I was at the Four Horsemen mass signing event. That was an experience in and of itself with twenty plus authors and a whole lot of fans. Working with Chris Kennedy and the others from that universe is always a pleasure and the enthusiasm and fun that everyone brought is contagious. 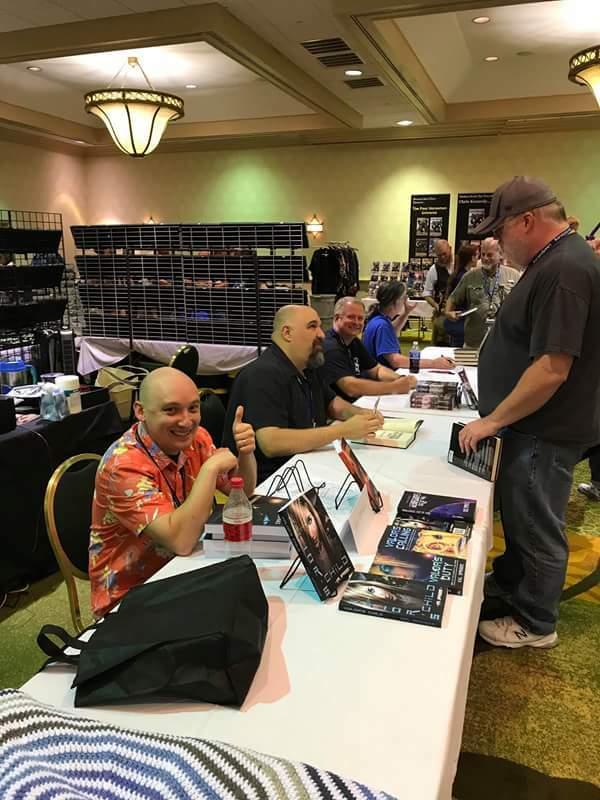 Saturday I also had a panel with Larry Correia, Quincy Allen, John Harness, and Lydia Sherrer on building a new monster. Poor Larry had no idea that he had been made moderator. Lydia was the one who’d had the idea for the panel and she stepped in well to get us started and back on track. It was a tremendously fun panel topic and the audience was great. Saturday I also had a panel on Space Opera versus Space Western with Julie Cocrane, Doug Dandridge, Laura Montgomery, and Mark Wandrey. We spent a fair bit of time discussing definitions and talking examples, but then we sort of rambled into discussing market and publishing. The audience had a lot of good questions, though and I think everyone (including panelists) got a lot out of it. I also had my reading and a couple hours of signing on Saturday. I read a section from my upcoming zombie novel. Hopefully those of you who were there enjoyed it. The signing was fun and I got to meet and see lots of great people. The location of the Authors Alley was perfect in that there was a lot of traffic flow and plenty of opportunities to meet people. I attended the Mad Scientist Roundtable on Saturday night for a bit, but the room was far too crowded and hot, combined with the long day, I slipped out early and went to bed. Sunday was the Kaffeeklatch, and that was a bit of a mixed bag. It was held in the same room as the Mad Scientist Roundtable, which means it wasn’t big enough and it got hot quick. I wish there had been a bigger room available and I am excited to see what comes up at the new venue next year. I do feel that the crowded nature of the room caused many people (including authors) to seek other places and it also encouraged some people to monopolize spots near some of the guests. In all, it didn’t have the friendly, relaxed vibe like most of the rest of the convention. Sunday I had my last signing session and then another panel in the Four Horsemen Universe. I got to announce my upcoming book with them, The Colchis Job. Which, I am happy to say, I sent in as a final draft to Chris Kennedy right after I got back from Liberty Con. Also on the panel was Chris Woods, whose book Legendary is fantastic and he’s working on he sequel. All in all, it was a fantastic convention. Its taken me almost all week to recover from, but that is part and parcel with a fun time plus travel. Liberty Con 32 for next year is already sold out. If you haven’t got tickets and want to go, then get on the wait list. I bought mine in the first thirty minutes and I am looking forward to it a lot. I might also recommend LTUE in Provo Utah, it has a lot of the same feel as Liberty Con and is a lot closer for those of us who live out west (plus they aren’t sold out).